Morning has dawned bright and warm. This is not good news for you, though. You had a broken night’s sleep. Knowing that you have to wake up, you barely succeed at dragging yourself to the bathroom. With your eyes barely open, you see yourself in the mirror and find that you have dark circles beneath your eyes. Feeling frustrated, tired, and weak, you know that it is definitely not a good start for the day. Does this story sound familiar to you? If it does, you might be suffering from insomnia. Insomnia is a condition of not being able to fall asleep, stay asleep, or return to sleep. Someone suffering from insomnia is not likely to have enough sleep. Poor quality and quantity of sleep is something far from a “good night”. This eventually leads to the deterioration of one’s quality of life and health. If you are suffering from insomnia, you will not have enough quality sleep. Before we talk more about insomnia and quality of sleep, let us find out more about sleep itself first. Sleep is the natural state of one’s mind and body becoming relatively less active and less sensitive, with less interaction with the surrounding environment. Scientists and doctors often conclude whether one is sleeping or not by measuring one’s brainwaves, or electrical impulses sent across brain cells and synapses. Even during sleep, brainwaves continue to change, repeating in cycles known called sleep cycles. Each sleep cycle is composed of two kinds of phases: the rapid eye movement (REM) sleep phase and the non-REM sleep phase. The brainwaves exhibited during sleep cycle are theta and delta for non-REM sleep and alpha and beta with some desynchronous waves for REM sleep, while it is usually the alpha and beta brainwaves that are exhibited when awake. The REM sleep phase, also known as paradoxical sleep, is the part of the sleep cycle when your brain sends out fast, desynchronized brain waves. This phase is named REM because the eyes also show rapid movements compared to the non-REM sleep phase. During this process, you are likely to experience dreaming. In contrast, your brain sends out slow brain waves during the non-REM sleep phase. During this phase, you are likely to be in the deep-sleep state, where your body temperature and heart rate falls while your brain uses much less energy. Each sleep cycle takes about 90 minutes on average. Sleep cycles occur several times during sleep. For most people, sleep is a very important part of one’s daily routine. Of course people do sleep instinctively since sleep is essential for staying alive and plays important roles in all aspects of mental and physical health. The most important role of sleep is recovery. When you sleep, your body and brain recover from fatigue accumulated during daytime activity. During sleep, body functions such as strength and metabolism improve as they are restored. Also, immunity systems and tissue recovery require sleep to be maintained in order to be effective. Brain functions are restored during sleep, too. Sleep helps cognitive skills and emotional control to function properly, and it enhances concentration and learning abilities. Additionally, sleep is also known to play an important role in improving willpower and relieving stress. The second role of sleep is information processing. When you sleep, your brain works in two kinds of ways to process information such as memories and emotions. One form of information processing is simply classifying and prioritizing information, especially memories. Your brain decides whether the information is important or not. Then, it saves the important pieces while it puts other information aside and in the back of your mind. The other way of processing information is by throwing away the negative emotions you had while being awake. Through this process, you will feel better when you wake up, after having a terrible day. This process only happens when you are in the REM sleep phase of the sleep cycle. Now that we are clear about why sleep is important, we can consider what happens when we lack sleep. According to experts, a lack of sleep damages us both physiologically and psychologically. This is mainly because if we do not sleep, it is difficult for the brain and body to recover fully from the natural wear and tear of tissues, as well as from injuries. Physically, lack of sleep weakens our strength and interferes in the recovery of the body. Our immune systems can easily be weakened by it. As body recovery and immunity are interrupted, we are more likely to be exposed to diseases. Some research indicates that lack of sleep is related to various problems in the circulatory and respiratory systems. According to the trade daily Electronics Times, a research team from the Seoul National University Hospital recently found that patients suffering from insomnia were eight times more likely to die from their conditions, if terminal, than patients who did not have any sleep disorders. All in all, insufficient sleep makes us unhealthy, and even brings us closer to death. Psychologically, a lack of sleep weakens concentration and willpower. This disturbs and downgrades learning and memorizing abilities. Creativity is also likely to be weakened. Moreover, cognitive skills - that is, our ability to acquire and retain information or skills - and emotional control will be affected by the lack of sleep, which could worsen our performance and relationships with others. Our ability to judge or discern favorable conditions and outcomes from unfavorable ones is also likely to be damaged. Furthermore, lack of sleep will make us feel more tired and eventually create even more stress. Contemporary psychologists and neurologists are discovering the exact mechanisms that govern our brains when we sleep, but the theories they base their studies on go back at least 100 years, to the work of two European theorists: Sigmund Freud and Carl Jung. The conscious mind includes every mental activity including the thoughts, feelings, and actions of which we are currently aware. For example, thinking about the taste of the food you are having for dinner occurs at this level. The pre-conscious mind includes all mental activities which are not presently active but stored somewhere in our memory. For example, remembering what you ate for dinner last night occurs at this level. The unconscious mind includes mental activities that people are unaware of. For example, remembering another food you ate before which has a similar taste to the food you are eating now occurs at this level. Freud asserted that this level comprises the largest part of our mental activities. Extending Freud’s theories, Carl Gustav Jung, a Swiss psychiatrist and psychoanalyst, claimed that dreams are related to the unconscious desires of the dreamers. According to his theory, dreams occur naturally from what he termed collective unconscious. He asserted that dreams have a compensatory function which allows mental activities that did not reach the conscious level to be revealed, often through a system of symbols and metaphors. However, Jung also added that not all dreams can be explained by this theory. The term sleep disorder indicates all sorts of disorders that interrupt healthy sleeping patterns. Sleeping disorders can be temporary, but sometimes they can seriously interfere with normal physical, mental, social, and emotional functioning. The best-known and, according to the National Sleep Foundation of the United States (SDF), the most common sleep disorder is insomnia. As stated above, insomnia occurs when you cannot fall or stay asleep. Taking too much time to fall asleep, waking up in the middle of your sleep, or waking up too early can all be symptoms of insomnia. In other words, having difficulty maintaining your sleep status is insomnia. Insomnia can be classified into three types. The first one is transient or temporary insomnia, which lasts less than a week. The next one is acute insomnia, which continues for weeks, but not more than a month. Acute insomnia is sometimes called short-term insomnia. The last and the worst type of insomnia is chronic. If insomnia continues for more than a month, it is chronic, and it sometimes causes serious problems. Insomnia can be caused by various factors. One well-known cause is stress. Stress increases tension inside you, and if this becomes serious it can interfere with your sleep. Daily life habits also lead to insomnia. There are several habits that can hinder your sleep. Doing certain activities can stimulate you before bedtime, most commonly using your smart phone late at night. Drinking alcohol and smoking can also lead to insomnia, since such activity changes metabolism. Breaks in a regular routine can have a negative impact on sleep patterns. If you sleep late during the weekdays and then wake up late during the weekends, this can cause you to have insomnia. Also, drinking too much caffeine, such as coffee and energy drinks can cause insomnia. In addition, some people suffer from insomnia due to other existing physical conditions or even genetically. It can be a symptom of a deeper condition. Now that we have considered of the causes of insomnia, we can consider in more detail what it leads to. People suffering from insomnia feel weary, fatigued, and sleepy during the daytime, and can be easily irritated and anxious, or even depressed. Insomnia can sometimes cause hormonal problems, as well. Another problem caused by insomnia is that the sufferer can start disliking sleep, as attempting to get to sleep becomes something difficult and stressful, leading a sufferer to avoid going to bed. This becomes a cause of stress, making the insomnia worse. The sufferer might eventually become anxious about sleeping and the routine for the next day. The sufferer might forget how to fall asleep and eventually get trapped in a vicious circle. Nowadays, many people suffer from insufficient and poor-quality sleep. According to statistics from the Health Insurance Review and Assessment Service (HIRA), the number of patients who visited the hospital due to insomnia has increased continuously in South Korea over the years. In 2012, 425,077 people visited the hospital because of insomnia, while in 2016 the number had increased to 542,939, or by 34.2 percent. According to the SDF, up to 40 million people, or more than 10 percent of the population, suffer from insomnia in the United States. These statistics also show that women and older adults are more likely to suffer from insomnia. Insomnia may be regarded as a social problem, not merely due to an individual’s habits or health problems. More generally, what are the causes of this phenomenon? Some people blame modern society. However, this is not exactly the right approach according to recent studies. Sociologists and anthropologists have recently found evidence that our ancient ancestors had about the same amount of sleeping time as modern humanity. 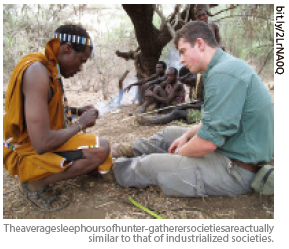 According to a research team from the University of California at Los Angeles, people from hunter-gatherer societies who live in a traditional way sleep under 6.5 hours on average, which is similar to people who live in industrialized societies. Among the three societies studied ? the San of Namibia, the Hazda of Tanzania, and the Tsimane of Bolivia?none suffer from prevalent insomnia or other sleep disorders, which is a sharp contrast to the industrialized world. The research concluded that the amount of time sleeping is not what really matters. In light of these findings, what are the factors that make such a difference? 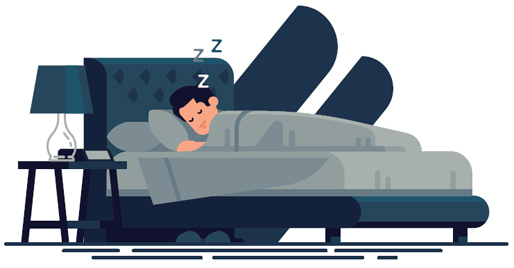 Jerome Siegel, who was a member of the research team and a former president of the Sleep Research Society, insists that it is not the length, but the quality of sleep that makes the difference. If so, what makes members of modern industrialized society have such poor sleep? The research team suggested a theory that ancient hunter-gatherer societies seem to adjust their daily routines to follow changes in temperature. It is possible that as members of industrialized societies tend to remain indoors and isolated from changes in weather and climate, they are interrupting natural daily routine and sleep patterns. A CNN article covering this research mentioned conventional advice from sleep doctors: exercise, healthy weight, reductions in caffeine and alcohol intake, and waking up at a consistent time. This advice might be what people in industrialized society lack: sufficient amounts of physical activity, healthy diet, and regular daily routine. To solve sleep disorders like insomnia and have quality sleep, you need to eliminate the causes. If, for example, you have problematic habits, try to get used to good habits that help you to get good sleep. You can try to keep regular routines every day or quit drinking too much caffeine. Kim Sang-soo, a counselor at the University of Seoul (UOS) Student Counseling Center, suggested that people who suffer from insomnia should find a solution by finding a good way to sleep so that they will no longer have to fear or be stressed about going to sleep. “If you spend your time in a satisfactory way that does not bother your sleep, the symptoms will improve. For example, reading a book could be a good way for some people,” Kim said. He added that finding a way to relax, such as meditation, helps solve sleep problems by reducing stress. Since insomnia can happen to anyone, knowing the solutions is essential to quality of life. Unfortunately, however, many people are not informed about the causes and solutions of insomnia or other sleep disorders. Here is a simple self diagnosis for insomnia from the Asan Medical Center. To complete it, check the items that you think are relevant to you. Then, count the number of items you checked. 1. It takes more than 30 minutes to fall asleep. 2. It takes effort to get to sleep. 3. You drink alcohol or take a sleeping pill to fall asleep. 4. You sometimes sleep as much as you want on days off. 5. You can fall asleep well if the environment for sleeping changes (For example, when you are on a journey). 6. You wake up more than twice while sleeping and have difficulty falling asleep again. 7. You often check the clock to see how long you have been asleep, or how much longer you have to sleep. 8. You are always drowsy during the day, especially after lunch. 9. You usually have dreams, and then you can remember their details. 10. You cannot fall asleep again if you wake up too early. If you check more than three of these items, you may suffer from insomnia. On average, approximately 30 percent of people are suffering from insomnia. Articles 1~4 are usually symptoms of initial insomnia and 5~8 are symptoms of a disorder in sleep maintenance. Articles 9 and 10 are symptoms you can go through if you are suffering from depression. Sleep is an essential and important part of our lives. Insufficient sleep causes several problems that could become serious. What matters in sleep is not the length, but the quality. 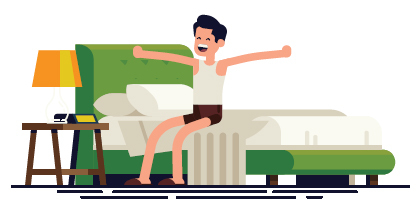 To have quality sleep, we need to maintain healthy sleeping patterns. We must learn how to sleep.